Nutra-Rinse is a high quality neutralizer and conditioner formulated to help eliminate alkaline residues on floors. Its special chelating action ties up the insoluble alkaline salts left behind by alkaline strippers that can cause floor finishes to powder or wear poorly. 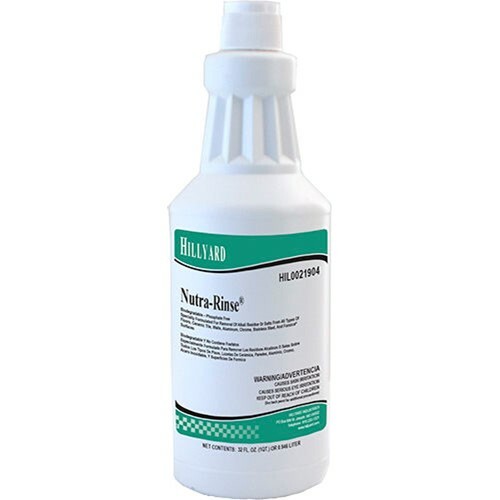 Nutra-Rinse allows stripper residue to be quickly and easily removed. Its labor-saving formula eliminates multiple rinsing steps. On most floors, a flood rinse, followed by a damp mop rinse, is all that is required.Nutra-Rinse works equally well at neutralizing the alkaline residue left behind from ice melt compounds (calcium chloride). Simply damp mop with a dilution of Nutra-Rinse or dilute in an auto scrubber to dissolve ice melt residues on hard floor surfaces and resilient tile. You can also use it to dissolve residues tracked onto carpet! Simply dilute and spray as a pretreatment or use in your carpet extractor. Dilution rate 4 oz per gallon. Versatile product for multiple uses.